Deposit Methods: Bank Wire Transfer, Maestro, Neteller, Visa Debit, Visa Electron, instaDebit, Visa, Skrill, Neteller 1Pay, ACH, Cheque, Bitcoin wallet, Litecoin wallet. EXCLUSIVE $32 NO DEPOSIT + 200% UP TO $200 FREE, ONLY FOR NODEPOSIT.ORG AND CASINO-BONUS.CLUB PLAYERS! Slotland was launched in 1998 and is one of the longest running online casinos offering one-of-a-kind no downolad slots and casino games. 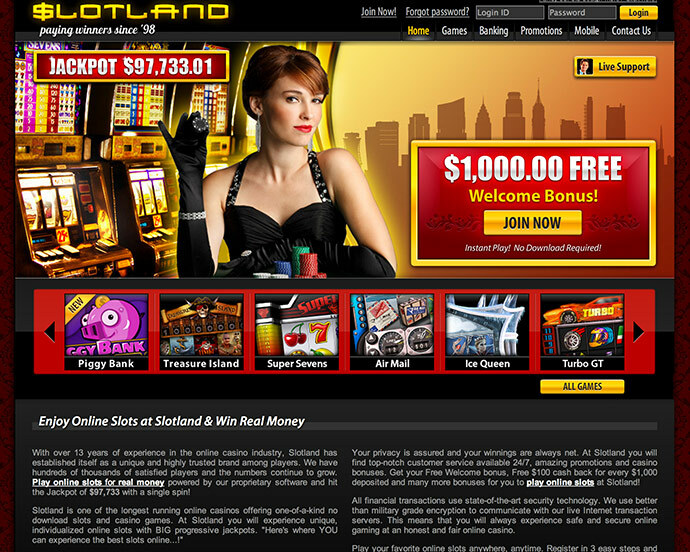 At Slotland you will experience unique, individualized online slots with BIG progressive jackpots. Slotland has a strong position in the online casino industry, their games are widely accessible and compatible with all available platforms. Play Slotland mobile slots on your cell phone, MAC, iPad, PC, AOL, PS3, MSNTV, every browser in the world is supported. Slotland Casino does not accept players from the following countries: China, India, Indonesia, Malaysia, Vietnam, Czech Republic, France, Latvia, Lithuania, Slovakia, Ukraine, Romania, Taiwan, Belarus, Turkey, Kazakhstan.